Got my first witnessed Ace at Swope league last night. It was hole #17 in the right side placement with my pink Wraith. Way to go. What was the payout, something around $290? I hear billy Nelson got hole 8 at Swope at Swope Spring Renewal on Saturday. Nice tourney ace there my friend. Got a Judge ace this evening. At the PDGA Wandering Wednesday league 5/14, Nick Altieri hit hole 8 at WyCo with Kevin Zane and Joe Hesting on his card. Ace fund was up to $195 at the time. 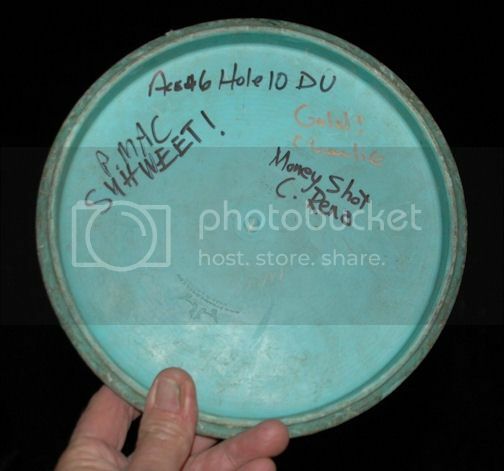 Yesterday (Saturday, May 17, 2014) on the Paradise Disc Golf Complex (Woodhenge Course, Hole 8, my card's 10th hole, 1st round) I threw an XD putter on Hyzer and skipped into the middle of the chains......payout is $634. ......and ace beer at the old settler's open !?! you may have to change your moniker from sandbags to moneybags! Nope on ACE beer at Old Settlers, however there will be some ACE beer at Birdland tomorrow before league around 5:05. More like "Gritty Money Bags" to me Jami. Now if he stepped UP and played Pro Master's, "GMB" would of placed 2nd and won $110.00 more..."
I think GMB is piling up the plastic to be the new DD distributor and take KleinMO's job. It is interesting to note that he did call his shot. Let us relive the legendary moment - needing an ace on the last hole to pass Steve and claim the always valued last cash spot on the Wandering League - Quinnie steps to pad and similar to Babe Ruth - points to the basket and says, "Count it. I am throwing an ace." Grabbing his trusty 178 g Rhyno - he rips it in the chains. When his wife found out that he called his own shot, she shrugs her shoulders and says, "Don't you say you are going to throw an ace on every throw?" Dan Quinn failed to put money into the ace fund and thus does not collect the pot. The story goes that he was late and only had a $20 and he did want to make the coordinator break it. Being late and making them break a $20 - he did not want to be "that guy." "My chances of Acing will increase if I do not pay." This is the first time that Mr. Quinn failed to pay for the Ace fund.